The Nurgle contingent is focused on the Deathguard Chaos Space Marine Chapter. It can be fielded as a Black Legion list or use the specialised Deathguard army list. The Cult element is a Nurgle themed Lost and the Damned formation. The paint scheme for the whole contingent is based on the distinctive green and bone of the Deathguard with some red highlights throughout. Decay and pestilence are the icon elements of Nurgle so most of the models in less than pristine condition. I have also borrowed heavily from the Warmaster and Warhammer Nurgle and Skaven ranges to add some distinguishing elements compared to the other chaos contingents. Deathguard Retinues: Befitting the Chaos god of disease and decay, the Nurgle retinue is covered in sores, including the Rhinos. The Deathguard list includes several types of retinues including unit types that are only upgrades in the Black Legion list. As a result I had to collect a surplus of most specialist units (relative to the needs of the Black Legion list). The core element is a retinue of regular Deathguard marines (using the old chaos marine models). The retinue has all possible character options. The retinue is supported by Plague Marines which can either form a separate retinue (with the Lord) or provide a smaller upgrade for the main retinue in the Black Legion list. There are only two Rhinos as only the smaller 4-model Black Legion upgrade has a transport option. The Deathguard formations can’t have transports. The situation is identical for the Havocs which can either be used as a 6-unit separate formation (without transports) or a 4-unit upgrade (with transports). Nurgle Terminators: A small unit of diseased Terminators can be used for deep strike attacks. The paint scheme is bleached bone and goblin green followed by a Devlan Mud wash. The Terminators can be supported by two Dreadnoughts. Nurgle Daemons: The Nurgle daemonic host is the smallest of the four gods with a group of Plaguebearer led by a Great Unclean One. Mortarion Primarch of the Deathguard can be used as a Daemon Prince for the warband. Deathguard Armoury: A small squadron of possessed Land Raider, a possessed Decimator, and a Death Wheel provide very steady support to the warband. The Decimator and Death Wheel are converted version of the Iron Warrior variants with a bit of Green Stuff pustules. Nurgle Daemon Engines: The old Nurgle Daemon Engines are worth their weight in gold these days but I managed to gather a formation of each type: A mighty Plague Tower and a squadron of four Contagion Engines. Pestilence Cult: The diseased followers of the Nurgle Cult are all classified as Mutants. The models are a mix of beastmen with the odd Plaguebearer thrown in. The core are two Covens with a variety of leaders. Nine of the Mutants can be upgraded to Big Mutants. I used 10mm Warmaster Rat Ogres for those. The rat theme continues with the “Chaos Hounds” upgrade for the Covens. These use 28mm Warhammer plague rats instead of “hounds”. The final upgrades are borrowed from the 10mm Warmaster range as well. The two Chaos Spawns are straight Warmaster Chaos Spawns. 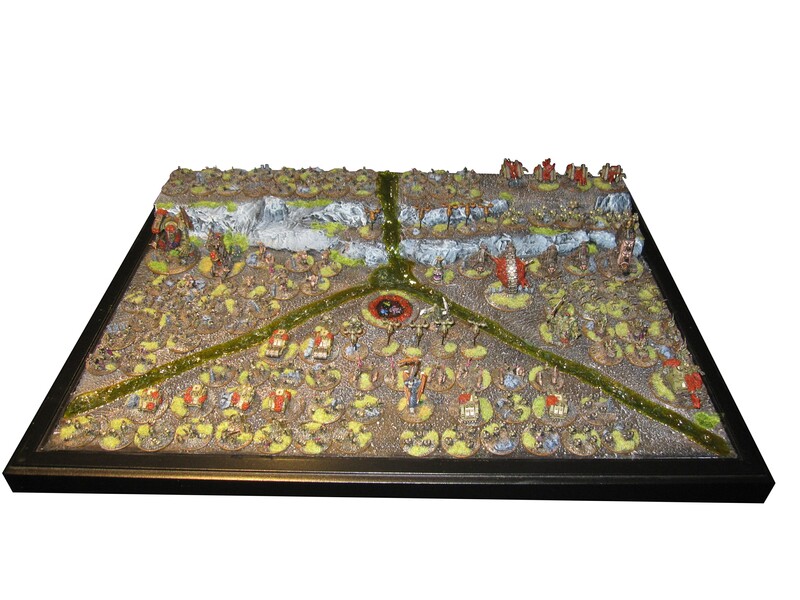 The Chaos Altar is a conversion based on a Warmaster Skaven Screaming Bell and some Warmaster Trolls to push it. Pestilence Cult Scouts: A squadron of Traitor Rough Riders give the Nurgle contingent some much needed mobility. The models are from the 10mm Warmaster range. I have also included two squadron of Blight Drones. These models are custom sculpts from a very talented artist on the TacComs forum. Pestilence Zombies: The Nurgle Contingent is also hope to the zombie horde. The models are actual zombies from the Exodus Wars range. Nurgle Titan: A mighty Banelord of Nurgle offers massive firepower. The model is a heavily converted version of the first edition plastic Imperial Titan with metal weapons and lots of diseased eruptions. Nurgle Objective: The Nurgle objective is a big cess pool of mutation.